Accidents can happen day or night. Unfortunately, accidents sometimes lead to painful tooth problems. If you ever need an emergency dentist in Payson, Arizona, you can count on Center Point Dental. Our professionals offer a warm community-style office. We offer excellent emergency care. There are plenty of issues that may have you searching frantically for an emergency dentist. We are always here for you! If after hours, our voicemail has further instructions. We hope you can know who to call long before a dental emergency occurs. If you need quick dental care, contact Center Point Dental. Tooth Loss: Knocking out a permanent tooth is, of course, a cause for concern! You need to have a dentist attempt to restore it as quickly as possible. Place the tooth back in the socket or in a plastic bag of milk and give us a call. Chipping or Breaking a Tooth: Damaging a tooth can be frightening and may cause further complications. Contact us immediately and rinse the mouth gently with room temperature water. Broken or Missing Dental Work: If you lose a filling or crown, call us before any further damage happens to your exposed tooth. We should repair the dental work straight away before bacteria finds its way deep into the tooth. 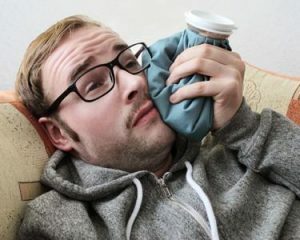 Toothache: Severe toothache? If your pain is enough to distract you or keep you awake at night, don’t wait to seek out emergency dentistry! Come seek relief from your dental emergency. Please don’t hesitate to contact us – we will do our best to provide same day services, and we even come in after hours by appointment! We are here for you and are happy to clear space in our schedules when possible if our patient has an urgent need.